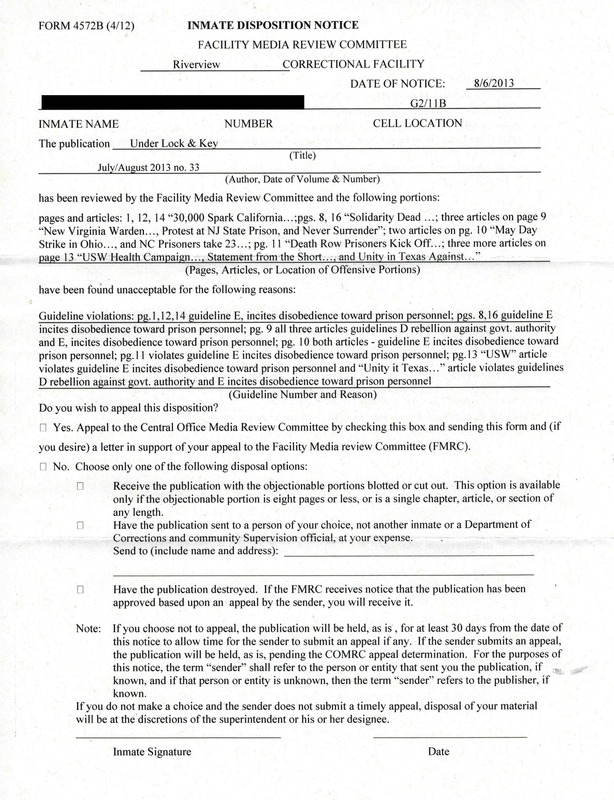 07/11/2013 Notice given for censorship statewide for "promoting violence throughout"
I received your letter from July 2 regarding issue 31 of Under Lock & Key. Thank you for looking into that matter. 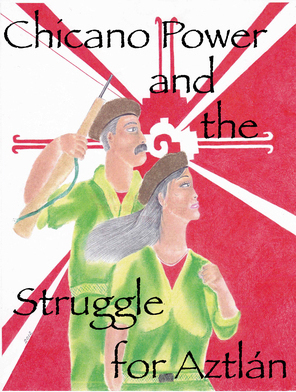 We will be following up with the subscribers to let them know that they should have received issue 31. I'm now writing you regarding issue 32. 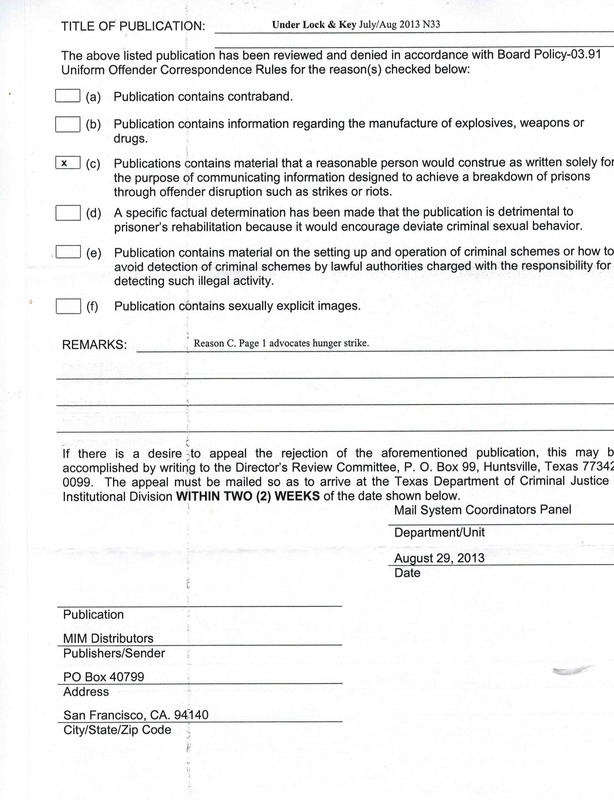 We received a notice that it was censored by the department for ?promoting violence throughout the publication.? There were no further details provided. 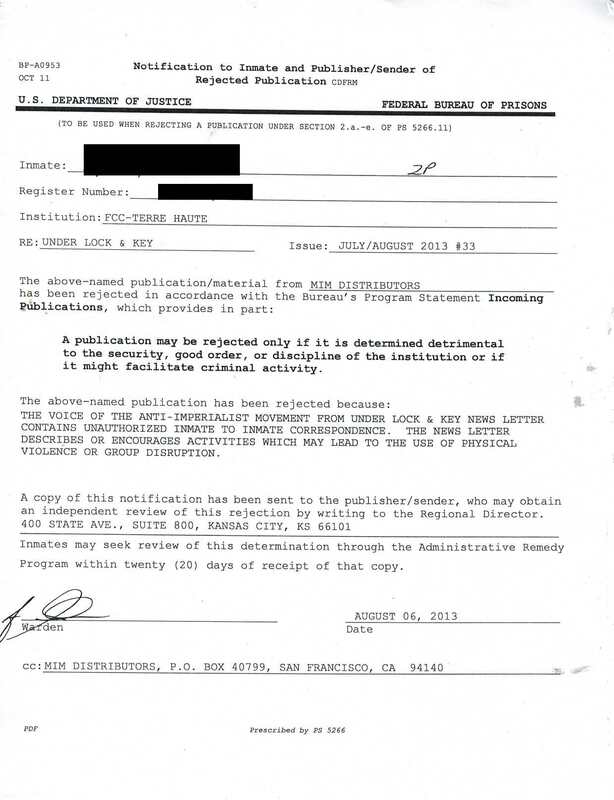 This was the first notice we received regarding this issue, it was dated July 11. After making a cursory review of the issue, I could not find any thing that promoted violence anywhere in issue 32. 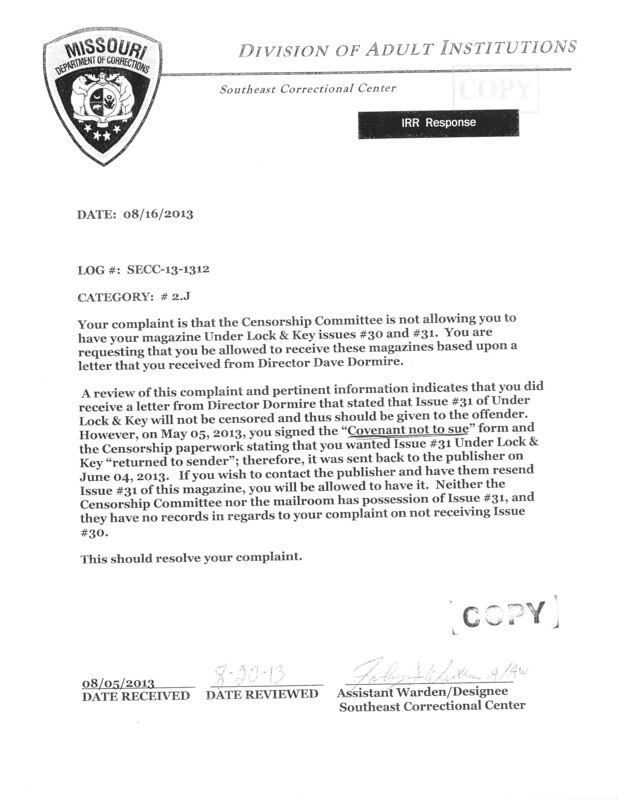 So I am once again requesting a review of the censorship of issue 32. In addition, I am requesting that whatever needs to be done to avoid frivolous censorship in the future be done. It is not fair to delay our mail for months every time when the mail does not pose any threat to safety. 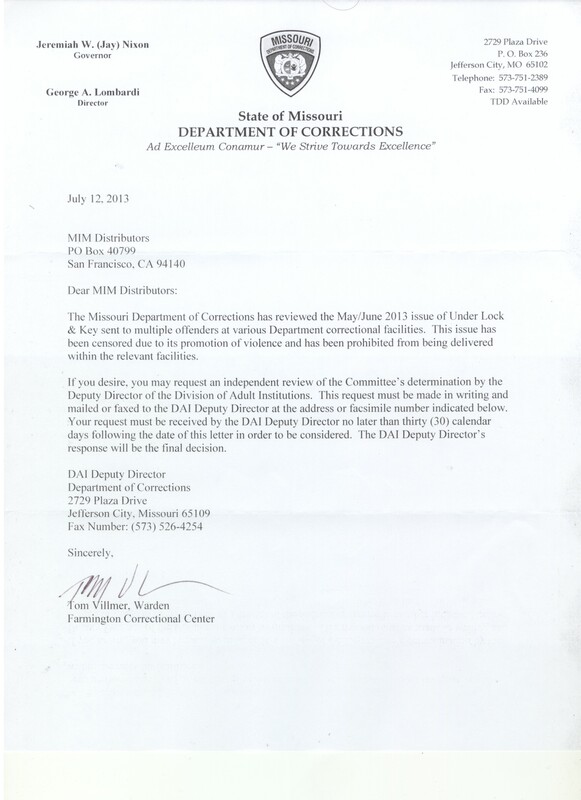 Thank you for keeping me infomred as to the status of the appeal against the censorship of Under Lock & Key here in the Missouri Department of Corrections. 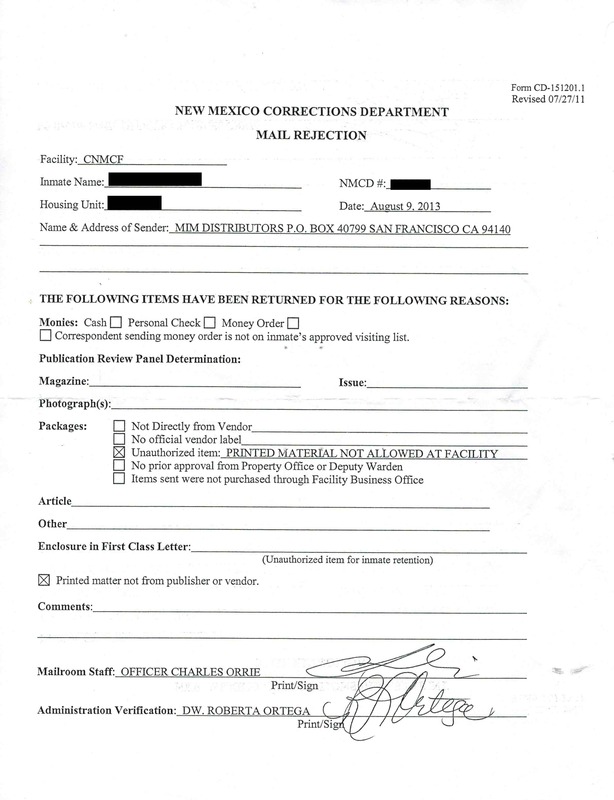 This letter is to inform you that at this time, I have still not received my copies of Under Lock & Key, nor have I recieved any notification from the Mailroom here at Farmington Correctional Center that my subscription was even being censored. 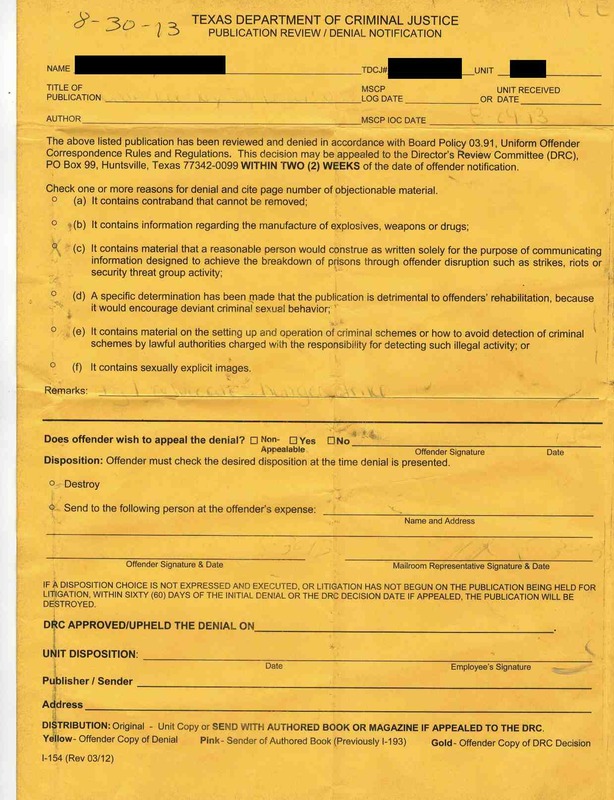 In direct contravention of Institutional Services Policies 13-1.1 Offender Mail Procendures and 13-1.2 Censorship Procedure, I have not once recieved a Censorship Notification with attached Covenant Not to Sue Form. I thank you for your diligence in pursuing this matter in the interests of incarcerated offenders everywhere. 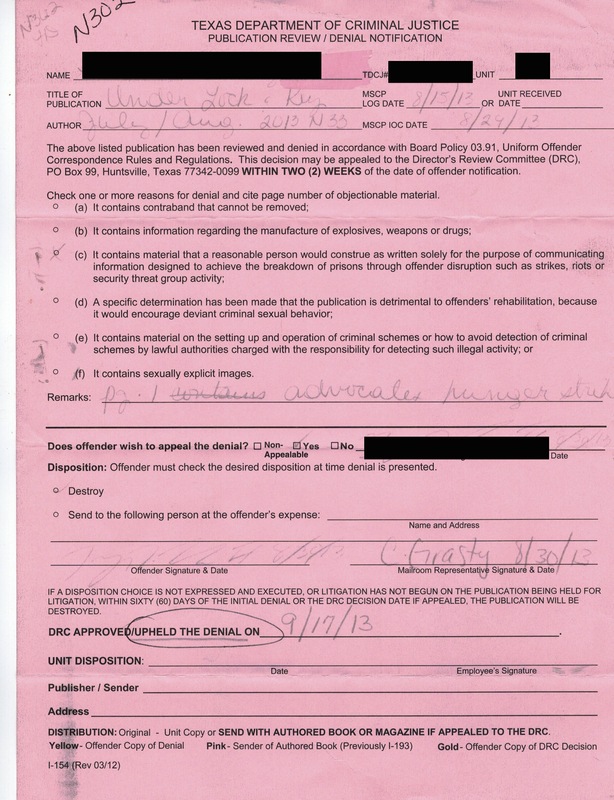 08/06/2013 Prisoner appealed censorship and won! 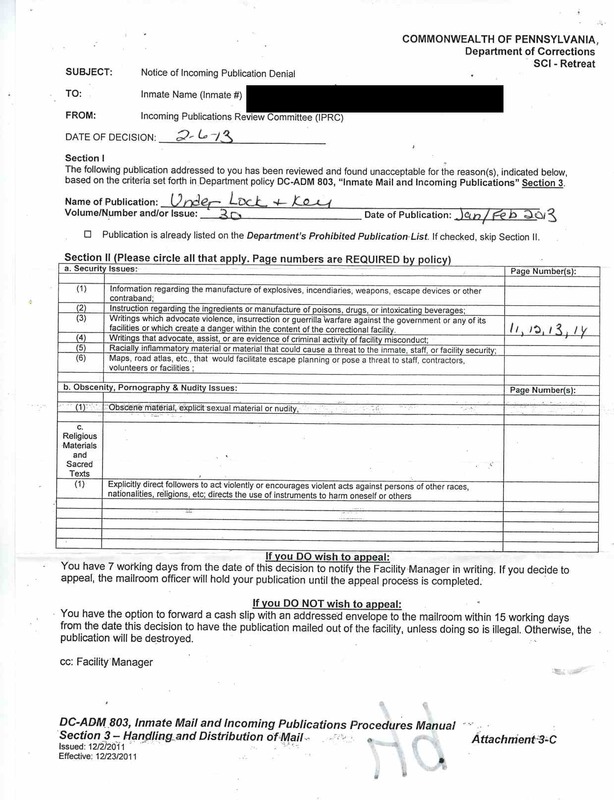 I wrote you back during the last quarter, telling you about how my institution confiscated one of my issues, and you at UL & Key sent me some case law that really helped me, forcing the institution to give the confiscated issue back and allow my issues to come through without any more problems. Thank you! 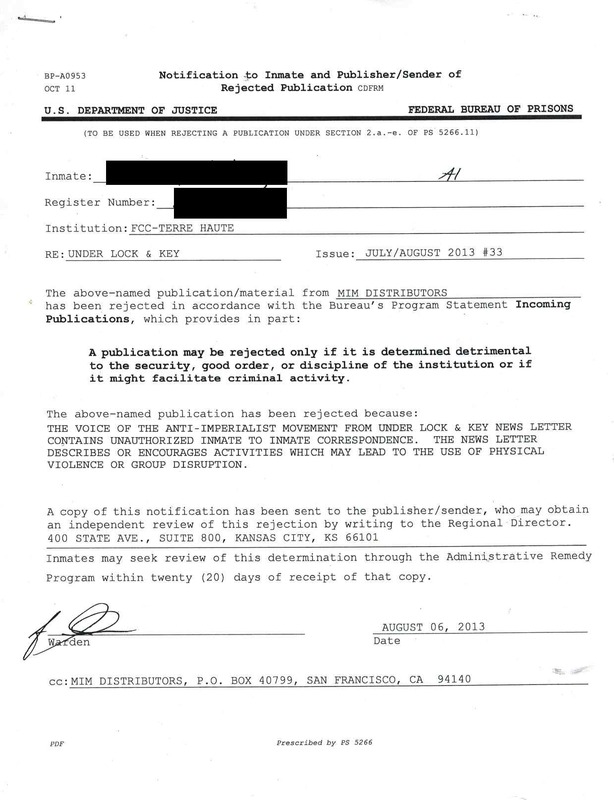 We have received many notices, from multiple institutions in the Missouri DOC that state that Under Lock & Key, Jan/Feb, Issue #30 has been censored by the department. This letter is to request an independent review of this decision. 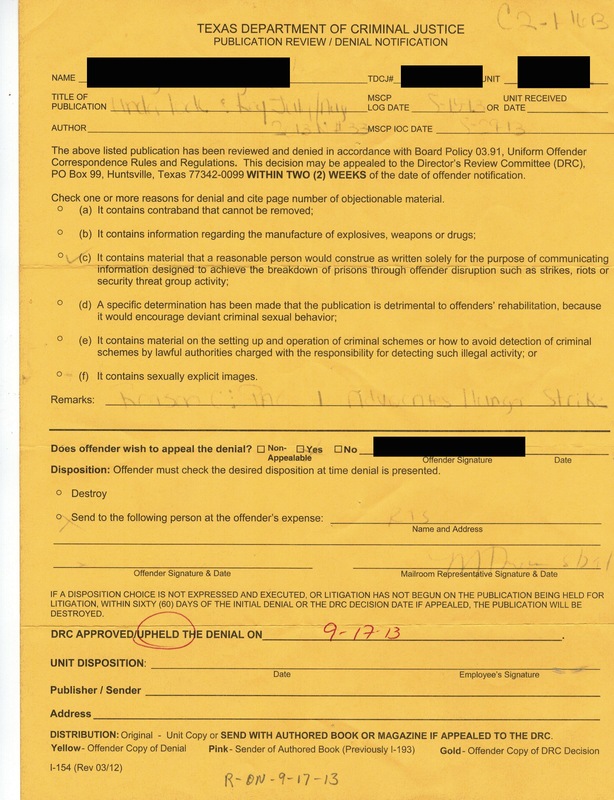 The reason stated is "IS13-1.2 Censorship Procedure III C-2 a.," which refers to "promotes, incites or advocates violence, disorder or the violation of state or federal law, or advocates, facilitates or otherwise presents a risk of lawlessness?" 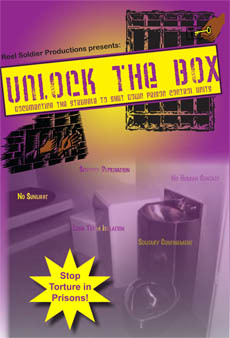 Under Lock & Key is very explicit in discouraging prisoners from using violence or from violating the law. 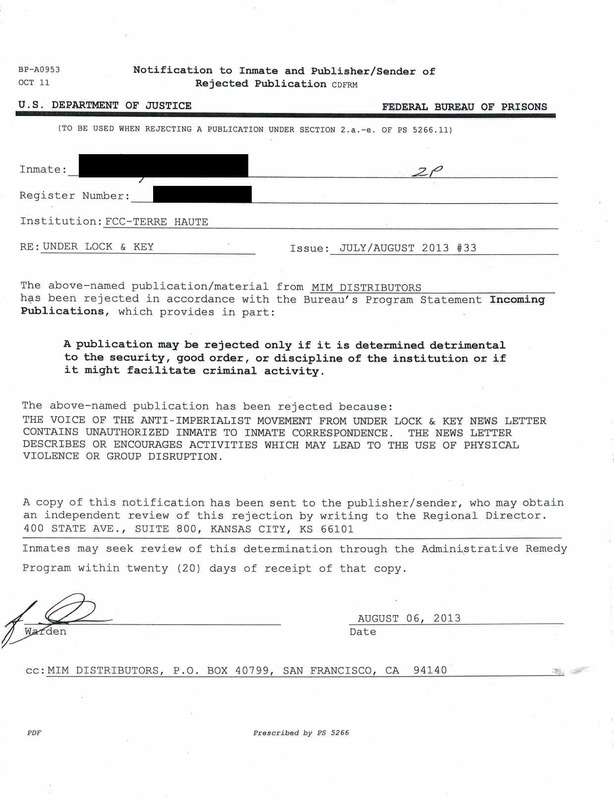 The notification cites pages 1 and 9 of the newsletter. While there is a reference to violence on both pages, neither could be construed to be encouraging or promoting violence. The first page contains a review of a book on economics and an article about the shooting that occurred in Newtown, CT. The artwork for the latter does depict Uncle Sam firing a gun, but this was a critique of the use of violence in this country and clearly not encouraging prisoners to follow suit. Page 9 contains portions of an article about segregation in schools, which has no mention of violence or lawbreaking, not to mention advocating it. This page also contains the beginnings of an article on censorship, coincidentally, that compares statements about violence made by the founding fathers to materials that were deemed "dangerous" by the Wisconsin DOC. Perhaps the reviewer in Missouri wanted to prove the writer incorrect that these statements by the founding fathers would not be censored by prison employees. But they were put forth to prove a point in a legal argument, which is the type of arguments ULK consistently promotes, not as a means to make any argument for violence as is evident by reading the article. It seems the reviewer mistakenly saw mentions of violence as promoting it, rather than reading the articles to see that they both served as a critique. 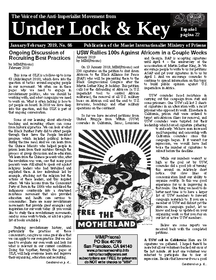 I hope you agree and allow the prisoners held throughout Missouri to receive their copies of Under Lock & Key Issue 30. Thank you for taking the time to review this matter.